My family and I just returned from a short mini-vacation to St. Louis. As we settled into our hotel room, I realized that we were very near the former home of my uncle's family -- a place we visited enough times when I was younger that it was familiar. 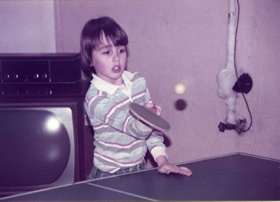 Ping-pong in the basement (that's me with the sweet haircut below), sledding down the hill in the backyard (and if I remember right, the backyard was ALL downhill) -- these are some of my memories of this place. 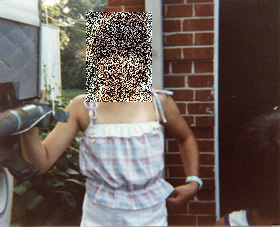 We also stopped there for a night in 1983 on our way to the Ozark Mountains and Silver Dollar City (where I got the gun that I shared in one of this blog's first posts). 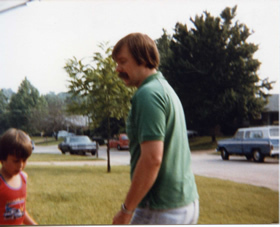 The photo below of me and my dad (and one of a "blurred" cousin) are from the morning we were heading that direction -- taken in the front yard of their home. While my kids (and my wife) napped one afternoon, the nostalgic sucker in me had to go find this house. Thanks to an address provided to me by my cousin via Facebook and a reliable GPS, I was there in less than ten minutes. I know. This means nothing to you as readers of this blog. But as I told my wife, stuff like this does my heart good. Nostalgia at its absolute finest. 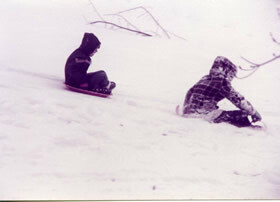 Memories of a time I was excited to be a kid. Not a time I was thinking, "Man, those houses have small yards." On another vacation note, I was happy to find that KETC out of St. Louis is still airing episodes of Mister Rogers' Neighborhood on a regular basis -- during the middle of the day, even. Not once a week in the wee hours of the morning. 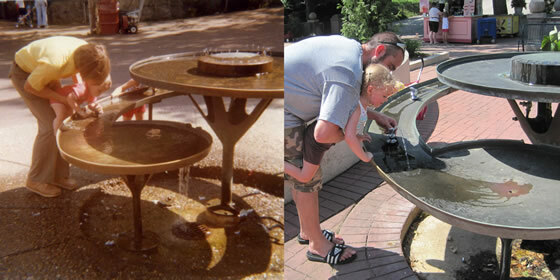 ...and the one below of my dad helping me drink from the same fountain...side-by-side with a shot of me and one of my daughters in the exact same spot 34 years later. Yeah. No big deal to you, I know. But to me...a very big deal. Oh but it is a big deal to me. 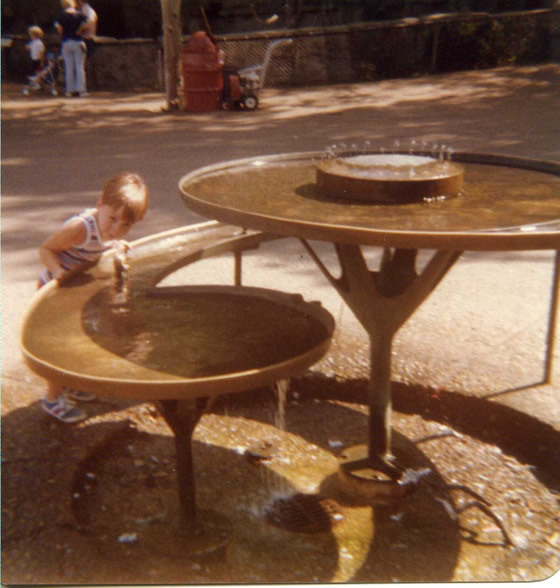 I grew up in an hour east of St Louis in Illinois and I know that water fountain well. I know exactly what you are talking about. Mr Lucky Doubles -- Do you mind me asking what town you grew up in? It sounds like our hometowns weren't far apart.